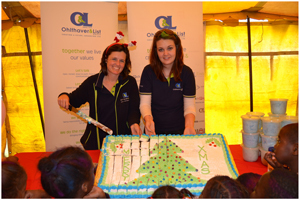 Tanya Payne and Leandra Van Bosch from Hangana Seafood had the tremendous pleasure of cutting the giant cake in front of the eager children. For the company’s trademark annual Christmas party for vulnerable children from the Walvis Bay community, Hangana had asked all other companies in the Ohlthaver & List Group to help support this event. Adding to the children’s delight, was the arrival of a real Santa Claus, literally with a truckload of gifts. Harnessing the combined power of its sister subsidiaries and its suppliers, Hangana Seafood this week hosted a monster Christmas party for more than 250 vulnerable children in Walvis Bay. At the Ohlthaver & List (O&L) Group of Companies annual Christmas party for Orphaned and Vulnerable Children (OVC) in Walvis Bay, approximately 254 children were treated to the joy of Christmas, sharing this remarkable experience with other children whose young lives are a constant struggle. Counting the children in Walvis Bay as well as Windhoek about 670 children in total each received a gift box made by employees of the various companies under the O&L umbrella. Through these initiatives – the O&L Group warmed many hearts and the children could experience the joy of a real Christmas. These initiatives were supported by all operating companies in the Group: Model Pick n Pay; Namibia Breweries Limited; Namibia Dairies; Broll Namibia; Dimension Data; O&L Energy; O&L Leisure; Hangana Seafood; Kraatz Marine; Kraatz Steel; Eros Air and Brandtribe. The orphans and vulnerable children at the coast were treated with lots of fun on the jumping castles, water slides, trampolines, face painting and various interactive games like “pin the tail of the cow”, kiddies bowling, treasure hunting and much more. There was delicious food such as hotdogs, juice, Oshikandela, a giant cake, candy floss and warm pancakes to warm their small bodies. The highlight was the arrival of Santa Claus dishing out sweets and gift boxes to the children. The happy faces were amazing and the children had lots of fun. Herman Theron, Managing Director of Hangana Seafood thanked all sponsors that contributed to this great initiative namely Guans Packaging, Metrotech, Logistic Support Services, Steel Africa, Afrox, Rent-A-Toilet, Bxtreme, Party Kidz, Adel Van Bosch, Woerman Brock Swakopmund, Spot-On Walvis Bay, and Casper Candy Floss. Theron wished everyone a most enjoyable festive season in the company of their family and friends. “I would like to reiterate the message of safety for this Christmas season and urge everyone to ensure safety and be cautious at all times when travelling. Enjoy the festive season, rest well and let us all get back home safe and sound in January 2014” he said.